GIF images are popular because they support animation so you can easily create an animated image and share it with others. Creating animated GIF images isn’t as hard as you think, and if you want to create your own GIF images today we’re going to show you the best tools to create GIFs. What is the best tool to create GIFs? If you’re looking for a simple application to create GIFs, ScreenToGif might be perfect for you. The application works as a screen recorder, so you can record any part of the screen and convert it to an animated GIF. This is especially useful if you want to create tutorials or convert videos to GIFs. The application supports screen recording, but you can also use your webcam to capture video. In addition, there’s also a sketchboard feature that you can use to record your sketches in real time. As for screen recorder feature, it comes as a resizable window, and you have to move it over a desired section of the screen in order to record it. If needed, you can change the number of frames from 1fps to 60fps. Keep in mind that increasing the frame rate will create a larger file. You can freely resize the recording window, and there’s an option to set a fixed size in pixels. 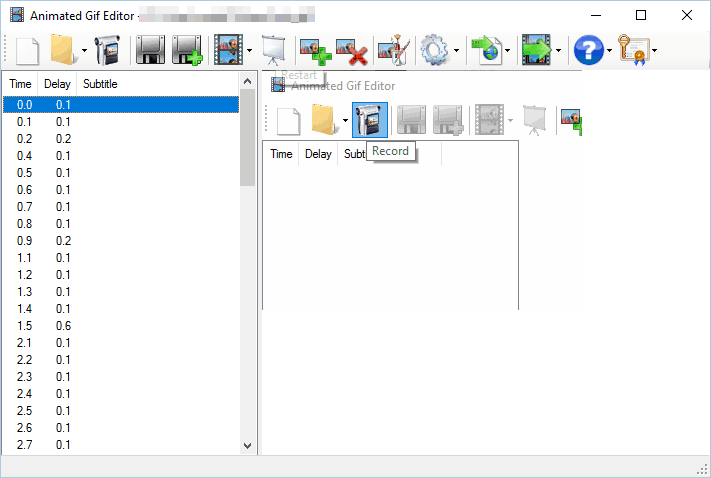 In addition, there’s a snap to window feature that allows you to select a window that you want to record simply by dragging and dropping. To control the recording, you can use the built-in icons or F7 and F8 keyboard shortcuts. After you record your GIF, you can edit it using the built-in editor. Editor allows you to see all frames in your GIF, and you can even remove unnecessary frames. If needed, you can reverse the playback or use the Yoyo effects. In addition, you can also move your frames or change their delay. If needed, you can edit each image by resizing, cropping or rotating it. You can also add text, captions and even text for key strokes. As for additional elements, you can add a progress bar, watermark, border or a freehand drawing to your GIF. It’s worth mentioning that you can apply some transitions to your frames such as fade and slide. According to developer, the editor supports GIFs from other sources, so you can easily edit other GIF images. After you create your image, you can save it as a GIF, video or image frames. You can also save it as a project and continue working on it later. ScreenToGif is a simple application that offers a wide array of features, so it’s perfect for every user that wants to create an animated GIF. The application is completely free and portable, so no installation is required. As for requirements, the only requirement is .NET Framework 4.6.1 or later. If you’re looking for a simplistic GIF tool, you might want to consider LICEcap. The application has a simple interface that allows you to record any part of your screen and turn it into an animated GIF. To do that, simply move LICEcap window over the part of the screen that you want to record and resize the window to the desired size. If needed, you can set the fixed size or number of max frames per second. After doing that, you just need to click the record button and you’re good to go. As for saving options, you can choose to add a title frame or elapsed time to your GIFs. In addition, you can also show mouse button clicks which can be rather useful for tutorials. You can also use keyboard shortcuts to pause the recording or set your GIF to repeat. If needed, you can also set the recording to stop after a specified number of seconds. We have to mention that LICEcap supports two output formats, GIF and LCF. While GIF is perfect for web, LCF format is designed for local playback. LCF format offers better compression ratio and better quality along with more than 256 colors per frame. Of course, you can also convert LCF file to a GIF or any other video format. LICEcap is a simplistic application, and its biggest flaw is the lack of GIF editor. Using this tool you can’t preview your GIF or edit it in any way which is a major flaw. Despite this limitation, LICEcap is a decent tool, and since it’s completely free, there’s no reason not to try it out. Another tool that can create GIF animations is GifCam. This application works as a screen recorder, so you can easily record any part of the screen simply by moving the application window. As for recording, there are three modes available, 10FPS, 16FPS and 33FPS. Of course, you can customize the available frame rate options if needed. You can also choose to show cursor or to record a full screen. 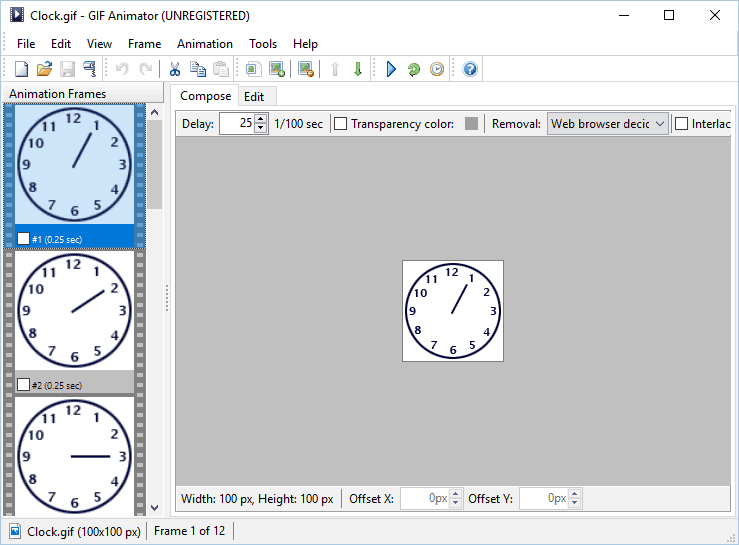 The application can detect if the previous frame is the same as the new one and add delays instead of new frames. By doing so, the application creates GIF files that are smaller in size. In order to reduce the size of the GIFs, the application adds transparent pixels after comparing frames. After that, it analyzes the frames and adds only different pixels to the animated GIF. Thanks to this method, the size of the output file is much smaller, which is rather important when creating GIFs for web. The application has a simple editor and you can easily delete frames, add text, resize or crop your frames. In addition, you can also adjust hue and saturation or even add a green screen for every frame. As for saving, you can save your GIF using 6 different presets. In addition to GIFs, you can also export your animation to AVI format. In order to achieve the desired results, you can also preview your animation at any time. There’s also a useful profile option that allows you to see a bar chart along with information regarding each frame. Thanks to this feature you can see the size of every frame, number of colors and percentage of green screen. This is a useful feature, especially if you want to optimize your GIF and reduce its size. 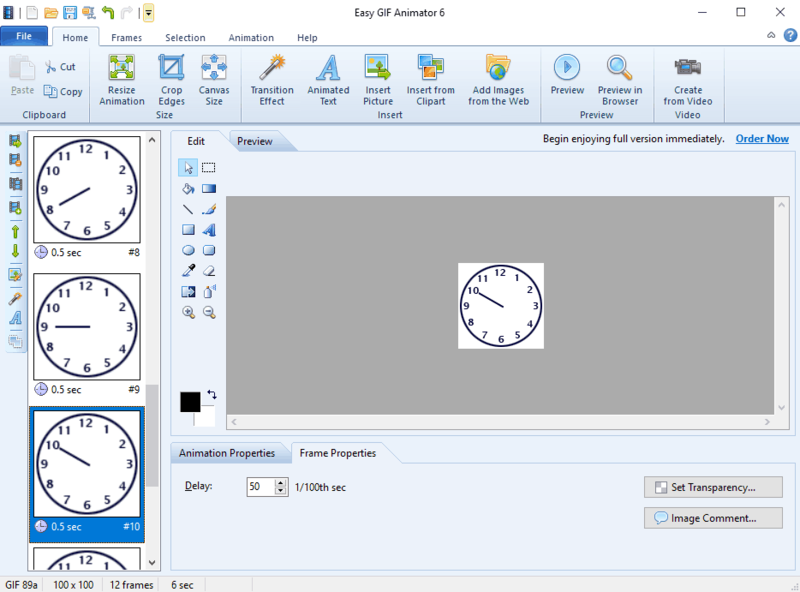 GifCam offers a wide range of features, so it’s perfect for every user that wants to create an animated GIF. The application has a humble user interface, and that is our only complaint. Even though the interface is humble, it can sometimes be confusing especially to new users. The application is completely free and portable, so be sure to try it out. If you’re looking for a powerful image editor that can also create GIFs, you should consider using GIMP. This is a cross-platform image editor and it’s available for Windows, Linux, and Mac OS X. The application is completely free, so you can download and use it without any restrictions. 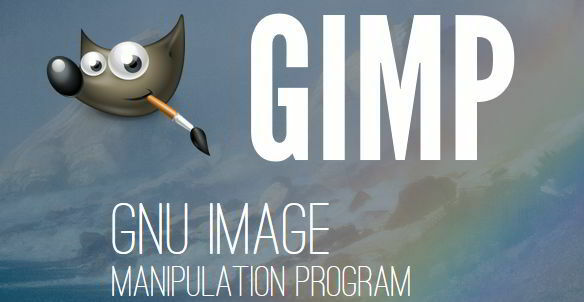 GIMP is perfect for graphic designers and it comes with all options that a photo editor needs. You can easily edit your images, change their color, hue, saturation or brightness and add special effects to them. In addition, you can create unique creations thanks to the built-in layer system. It’s worth mentioning that the application also supports programming algorithms so you can easily edit your images using scripts. Another great feature of GIMP is the ability to enhance it with various plug-ins. Speaking of plug-ins, you can easily create animated GIFs from videos by using GIMP Animation Package plug-in. After you download the plug-in, you’ll be able to create GIFs from videos with ease. Even though GIMP isn’t a GIF tool by default, you can still use it to create GIFs by using special plug-ins. The application is perfect for everyone who needs an image editing tool that can create GIFs, so feel free to try it out. Another simple application that can create GIFs is AnimateGIF. The application is rather simple, so it doesn’t support screen capture or videos. In order to create a GIF, you need to manually insert your pictures in order to use them as frames. After that you need to set the frame delay and the quality of your GIF. If needed, you can also enable loop option in order to repeat your animation. AnimateGIF doesn’t have much to offer, so there’s no options for editing or screen capture. However, if you already have images or frames exported from a video, you can easily combine them and create a GIF image with this tool. Even though this application is simple to use, it can create the most basic GIF images which is its biggest flaw. If you need to create GIFs from videos or capture your screen, you might have to use a different tool. If you’re still interested in AnimateGIF, you can download it and use it for free. QGifer is another tool that can create GIFs from videos. The application can create a GIF file from .avi, .mp4 and .mpg files. Once you open a video, there are playback controls available so you can easily find the section that you want to use for a GIF image. There’s also another slider that allows you to choose start and end point of your GIF. The application has a toolbox in the left pane and you can use it to adjust FPS, zoom level and looping options. QGifer also supports margins as well as various filters. If needed, you can also change the hue, saturation or brightness of your GIF image. As for output options, you can choose the starting frame as well as ending frame. If needed, you can also adjust the width and height of your image and change the palette size. In terms of editing, the application allows you to add images and text to your GIF images. It’s worth mentioning that you can position both text and images any way you like and choose the frames in which they will appear. After doing that, you just need to extract your animation as a GIF file. Once the animation is rendered, you can preview it, append a reversed copy or save it to your PC. 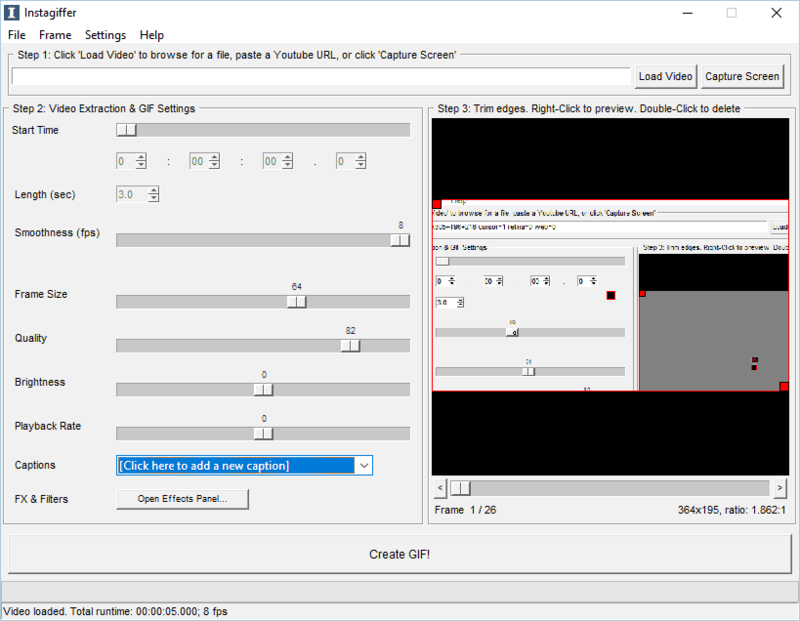 QGifer is a solid tool that can convert any type of video file to a GIF image. The application is relatively simple to use, so you’ll be able to create GIFs with ease. Some editing options are missing, such as the ability to view and delete individual frames. Due to lack of these features, you might want to consider using a different application for advanced editing. As for QGifer, the application is completely free so be sure to try it out. Another application that can help you create animated GIFs is Giffing Tool. This application allows you to record any part of your screen and convert it into a GIF file. 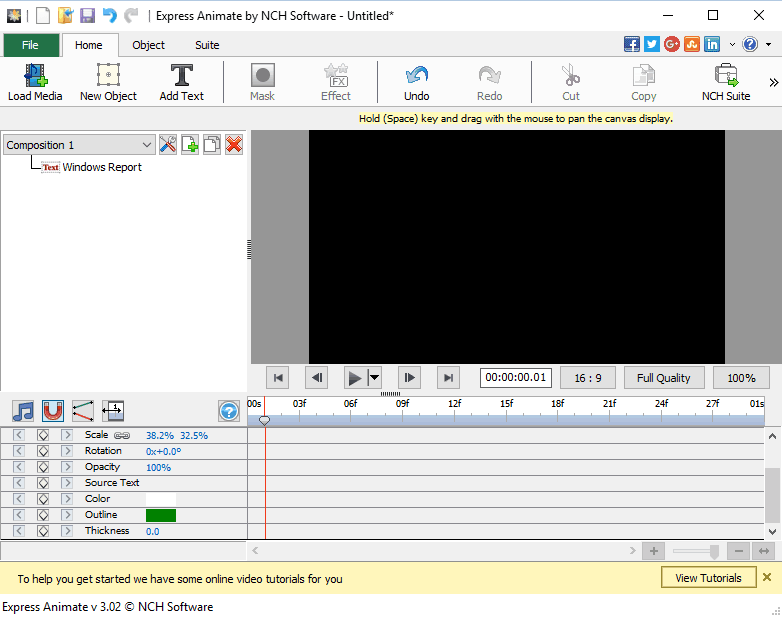 After you record a video, you can preview it, cut, paste and copy specific frames. In addition, you can change the size of your GIF as well as its quality and frame rate. As for editing, you can add captions or apply grayscale or luminate effects. You can also crop an image or import new files. If needed, you can also record the same area again or choose a different area to record. After you finish editing, you can save your GIF image locally or upload it online and share it with others. If needed, you can also convert video files to GIF images using this tool. List of supported formats includes .gif, .avi, .mp4, and .web. The application also has few preset sizes that you can use to convert videos from popular video streaming websites such as YouTube, Vimeo or Twitch. Giffing Tools offers a wide array of features, so it will be perfect for both basic and advanced users alike. The application is completely free to use, but it comes with a small message at the bottom. If you want to remove the message, simply donate any amount to the developer. We also have to mention that the application is completely portable, so you don’t have to install it in order to run it. Gyazo is a simple tool that allows you to create screenshots with ease. To create a screenshot, you just need to start Gyazo or press a keyboard shortcut. After selecting the desired area, the screenshot will be uploaded online and you’ll get a direct link to it. All your screenshots are saved on Gyazo servers and you can easily search them by app name, web address or date. In addition to images, you can also create animated GIFs with Gyazo GIF application. This application allows you to create GIF animations up to 7 seconds in length and it will automatically upload saved images online. Just like with regular screenshots, you can select the screen section that you want to record. Unfortunately, there’s no editing options so you can’t edit or preview your GIF file. Gyazo is completely free, but it comes with certain limitations. If you want to remove these limitations and create one minute GIF animations, you might want to consider purchasing Gyazo Pro monthly package. 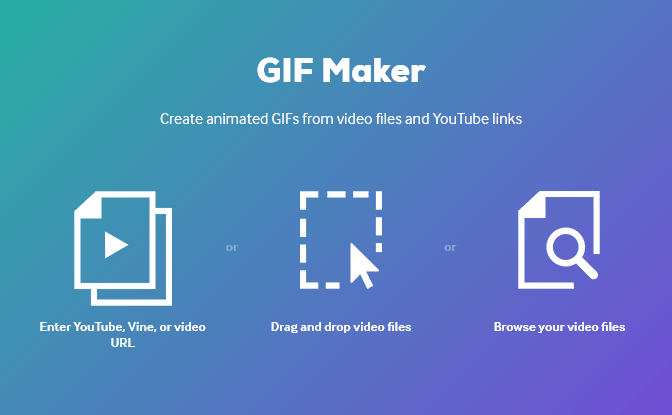 Another great tool that can help you create animated GIFs is GIF Animator. This application is simple to use, so you can easily create animated banners, buttons and all other kind of GIF images. Using this tool you can view all animation frames in the left pane, and you can also preview your GIF image at any time. Frame editing is also available, and you can crop, resize or rotate your frames. In addition, you can also duplicate or remove unnecessary frames. 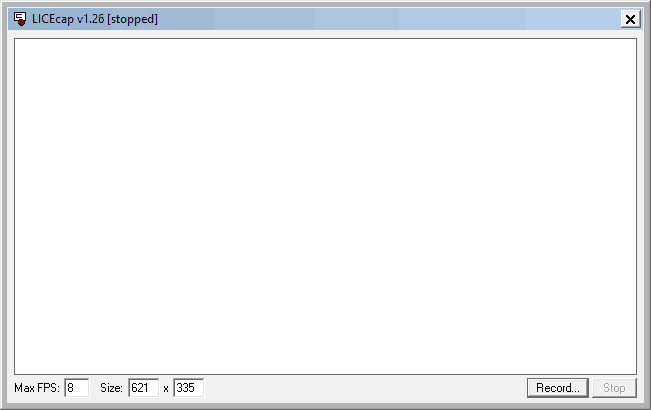 Lastly, there’s a built-in image editor so you can easily edit any frame. To create a GIF, you just need to add all images that you want to use as frames. The application supports wide range of formats such as JPEG, PNG, TIFF, GIF, BMP, PSD, ICO and many more. Of course, you can also convert a local video to a GIF image. However, it’s recommended to use shorter videos in order to avoid performance issues. It’s also worth mentioning that you can edit already existing GIF files, which can be quite useful. The application is simple to use, and it even comes with a wizard tool that supports wide range of effects and transitions. To reduce the size of the output file, there’s also an advanced optimization feature available. As for advanced features, there’s a batch mode that uses the command line interface. If you’re a web developer, you’ll be pleased to hear that this application can generate HTML code so you can easily insert GIF images to your projects. GIF Animator is a solid application and it offers all the necessary features. Our only complaint is the lack of screen recording feature, but this isn’t a major flaw. The application is available for free trial, but if you want to continue using it, you need to purchase a license. If you’re looking for a GIF tool that can create animated pictures, banners and buttons, you might want to consider Easy GIF animator. 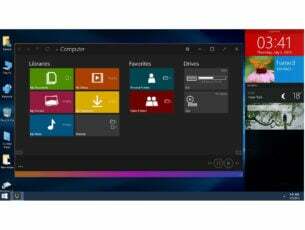 The application offers a great user interface that is similar to Microsoft Office, so you should be able to use it without any problems. Using this application you can see all your available frames in the left pane, and you can easily delete or rearrange them. In addition, there’s a built-in image editor so you can easily edit any frame with ease. If needed, you can also add various transition effects or create an animated text. There’s also a built-in compression feature so you can easily optimize and compress your images. If needed, you can also save your project as an SWF Flash file or as an AVI video. It’s worth mentioning that you can also add background sounds to your SWF animations. You can also easily resize animated GIF images or crop them with a single click. As for advanced options, Easy GIF Animator has a built-in color picker as well as the ability to replace colors. There’s also a transparency tool available so you can remove backgrounds from your images with ease. The application also supports image web search so you can easily find images online and use them for animation. Of course, you can generate HTML code and instantly add your GIF to any website. Lastly, we have to mention that you can convert any local video into a GIF image. Simply add the video and select the segment you want to use as a GIF. If needed, you can also reduce the frame rate in order to minimize the image size. After doing that, the frames will be added to the application and you can edit them any way you want. Easy GIF Animator offers a wide array of features along with great user interface. The application is simple to use, so you should have no problems with it. Our only complaint is the lack of screen capture feature, but despite the lack of this feature this is still a great application. The application is available for 20-day trial, but if you want to continue using it, you need to purchase a license. 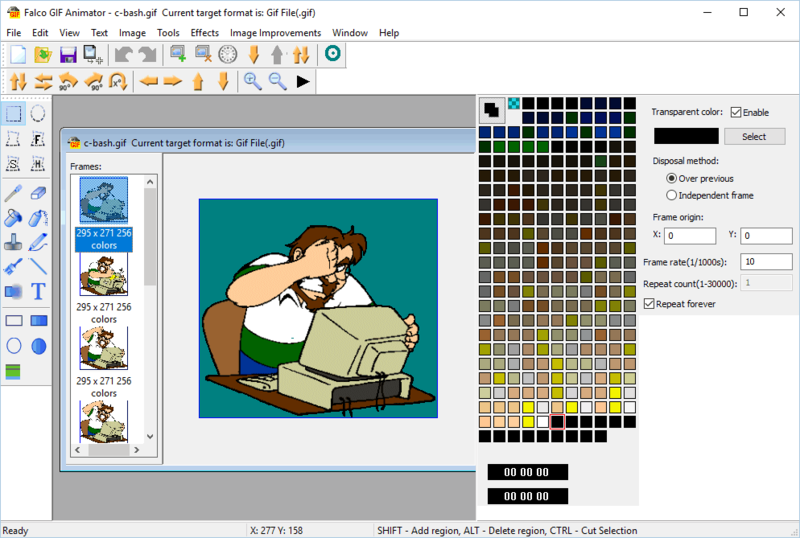 Instagiffer is another simple application that allows you to create animated GIFs on your PC. This application offers a humble user interface, but it makes up for it with a wide range of features. The application allows you to convert local videos to GIFs, but you can also paste a YouTube URL and convert an online video to GIF with ease. According to the developer, the application also works with other video hosting websites. As for video extraction, after you load the video you just need to set the start time using the built-in slider. If you want to make precise selections, you can also set the exact time in minutes, seconds and sub-seconds. After selecting the start position, you need to set the desired length and smoothness. In addition, you can also change other options such as frame size, quality, brightness and playback rate. If needed, you can also add captions or various effects and filters. As for text, you can add it as a caption, change its color, font or size, and assign animations to it. In addition, you can also choose start and end frame for your text. Unfortunately, you can’t position the text freely which is a flaw in our opinion. 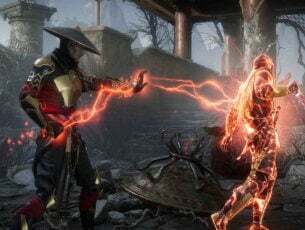 As for effects, there are about 10 visual effects available to choose from and you can also add your own background sound. The preview is available at all times and you can use it to easily crop your GIF image. The application also has the ability to edit other GIF files which can be rather useful. You can also import, export or delete specific frames. Unfortunately, this option is available from the dropdown menu so it’s not as advanced like in other applications. The application also allows you to capture certain part of a screen and turn it into a GIF. To do that, simply select the desired area, set the desired length of the video and click the Start button. After you record your video, you’ll be able to configure your GIF image with ease. Instagiffer offers a wide array of features, and it’s perfect if you need to create a GIF from a local or a web video. Thanks to the screen capture feature, you can also use this app to create simple tutorials. As for flaws, our only complaints are inability to edit each frame individually and limited text support. Despite these limitations this is still a great tool, and since it’s completely free and portable there’s no reason not to try it. Another application that can convert video files to GIFs is Free GIF Maker. The application has a simple to use interface that allows you to preview your video and select the section that you want to turn to GIF. To select the desired parts easier, you can use the playback controls but you can also navigate frame by frame in order to make accurate selections. To make this process straightforward, you can also use keyboard shortcuts for playback or frame by frame navigation. After you select the desired segment, you need to choose some output options. For example, you can set your animation to loop or you can change its speed, colors and size. As for supported formats, the application works with AVI, MPG, MP4, MKV, FLV, 3GP, WEBM, WMV and other file types. Free GIF Maker is a free application, but some options aren’t available in the free version. Even though this application is simple to use, it doesn’t offer any advanced options such as frame by frame editing or screen capture. Despite these limitations, this is a decent tool if you need to convert a video to GIF, but if you want to make any additional editing you’ll need to use a different tool. If you need to create GIFs from your screen recordings, you can do that with ease using this tool. To create a GIF, select the part of the screen that you wish to record and click the record button. In addition, you can also use this application to edit other GIF files. After you load the desired GIF, you can see all available frames and preview, edit or remove them. As for editing, the application doesn’t have a built-in editor so you have to rely on third-party applications. You can change the frame delay right from the application, and you can also reorganize your frames. If needed, you can add a subtitle to your frames. You can also set the animation to repeat or change the subtitle style by editing its CSS code. Speaking of coding, you can also export HTML code for your image and add it to other projects. In addition, you can also export your animation to GIF or you can export only the selected frames. If needed, you can also export GIF to AVI, export subtitles or resize your GIF. Animated Gif Editor offers solid features, but it doesn’t allow you to edit your frames from the app. As a result, it’s a lot harder to add text or to add other elements to your GIF image. You can download this application for free, but the free version will add a watermark to all your GIFs. To remove the watermark you’ll need to purchase the full version. It’s also worth mentioning that this application is portable, so you can use it without an installation. Another application that can convert videos to GIFs is Free Video to GIF Converter. The application has a simple to use interface so you should be able to convert video files with ease. To convert a video you need to choose the desired file from your hard drive. After adding the video you need to select the segment you wish to convert to GIF. If needed, you can also crop your image before the conversion. As for additional options, you can change the size of the output file, frame rate, GIF speed or even set your GIF to loop. If needed, you can also add text or a logo to your GIF. We have to mention that text support is rather limited so you can’t choose in which frames the text will appear. Free Video to GIF Converter is a simple tool and it doesn’t offer any advanced options. As a result, you can’t edit individual frames or rearrange them. Since the application offers only the most basic features, it will be suitable only for basic users. The application is free, but it adds a watermark to all your GIFs so you’ll need to purchase the full version to remove it. This is an animation software, but you can also use it to create GIFs from videos. The application allows you to add both objects and various effects to your videos. Of course, you can create smooth animations using the keyframe feature. The application allows you to add video and image files to your video, and you can easily move, resize or rotate them. Of course, you can add various effects and change brightness, contrast, etc. The application also works with text, and you can easily add it and animate it. To make the editing process simpler, you can group your objects in order to organize them better. This application supports vector masks as well as blending modes, and by combining them you can create some impressive results. Each object is available on the timeline so you can easily access it or set in which frames it will appear. 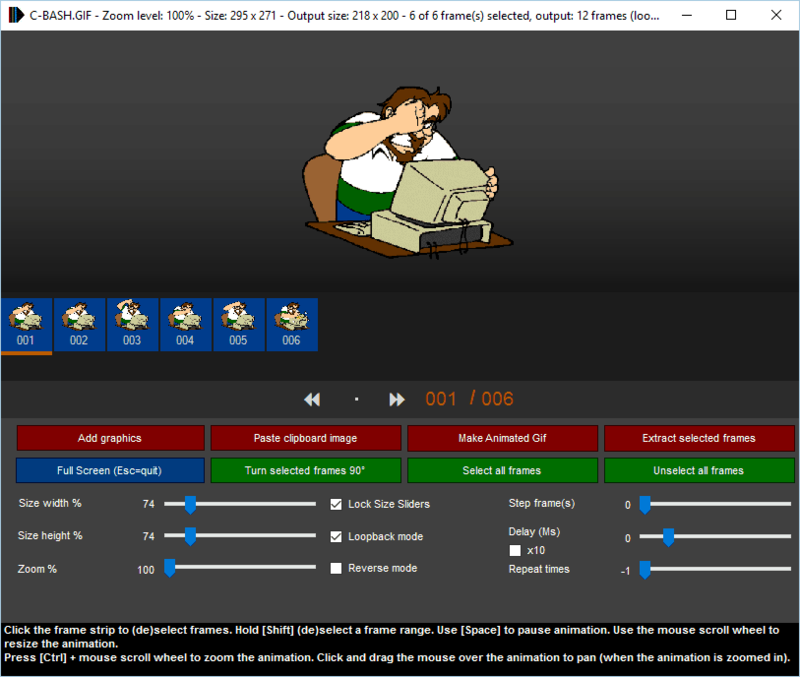 Express Animate is a video animation software, but it allows you to save your animations to Flash, GIF or HTML5 format. The application offers a wide array of features so it will be perfect for designers and animators. On the other hand, due to its complexity some users might have issues adjusting to this application. Express Animate is free, and if you’re familiar with animation software be sure to try it out. Another application that can help you create GIFs is PhotoScape. This is image editing software, but you can also use it to create animated GIFs. The application also works as a photo viewer so you can easily view photos or create a slideshow. There’s also support for image editing and you can easily adjust both brightness and colors of your images. In addition, you can also add frames, text and other pictures. There’s also an ability to resize or crop images, and you can even use tools such as paint brush, clone stamp tool and effect brush tool. Batch editor feature is also available so you can easily edit multiple images with this tool. The application allows you to combine images, so you can easily create one large image from smaller images. If needed, you can also split any image into several smaller images. The application also has a screen capture tool so you can easily create screenshots. There’s also a batch rename feature so you can easily rename multiple files. If needed, the application can convert RAW images to JPG, and there’s even a useful Face Search feature. As for GIF animation feature, it’s rather basic and it requires you to insert your frames in order to create an animation. Even though you can see all available frames, there aren’t many editing options available, so you can’t add captions or any effects to them. However, you can choose different transition effects and you can set delays for each frame. If needed, you can resize your image to a specific size or preview the animation at any time. 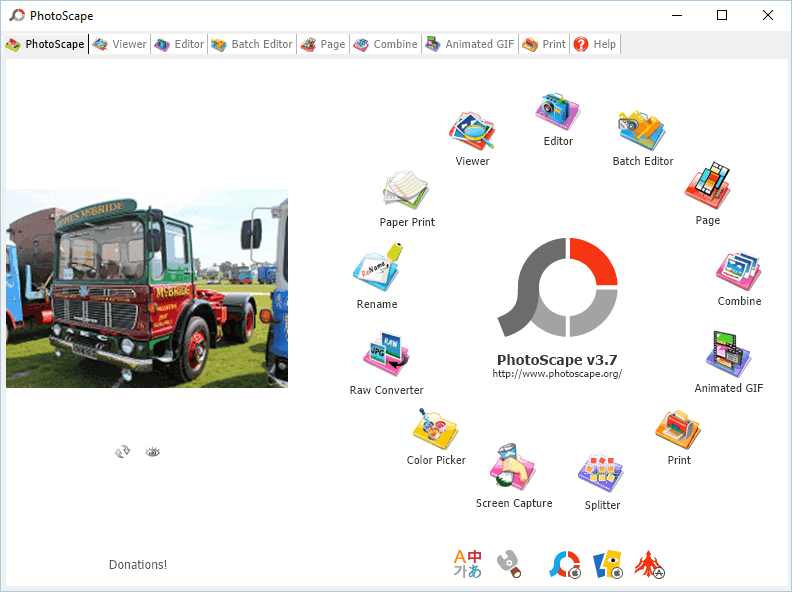 PhotoScape is a solid image editor, but it doesn’t offer many options for GIF animation. You can’t import videos or record your screen which is a major flaw in our opinion. Despite this limitation, if you’re looking for a free image editor that can create simplistic GIFs, you might want to consider PhotoScape. 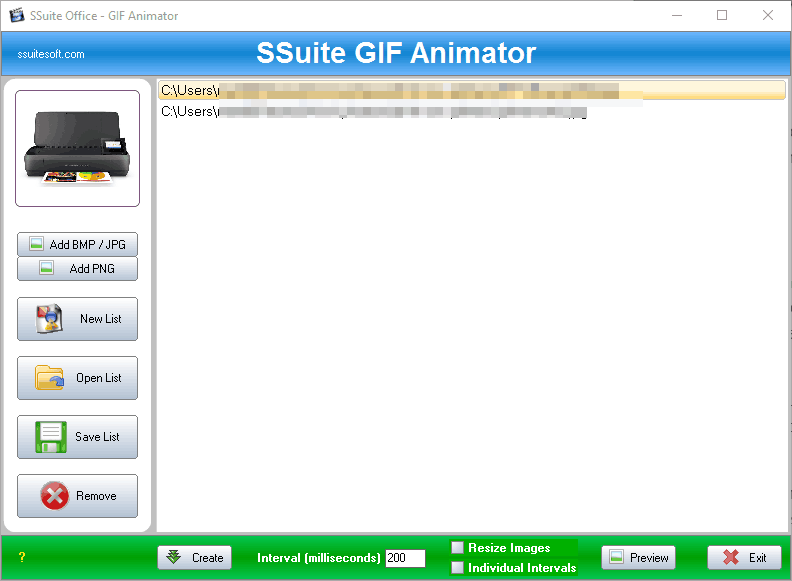 Another basic GIF creator that we want to show you is SSuite GIF Animator. This is a simple application that allows you to create an animated GIFs from BMP, JPG and PNG images. Simply select the images you want to use as frames and set the delay. You can use the same delay for all images or set a specific delay for each frame. The application also allows you to resize your images before you create a GIF. If needed, you can also save the list of frames and use it for future projects. 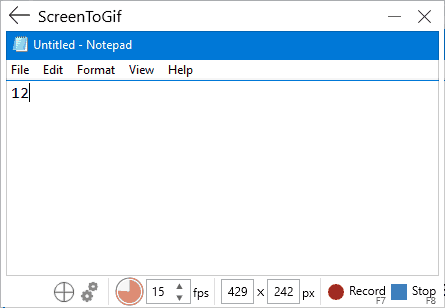 You can also preview GIFs using this tool, but in order to do so first you need to load the GIF file from your hard drive. This means you can’t preview the GIF you’re currently working on, which is a major flaw in our opinion. The application doesn’t offer any type of editing, so you can’t add text or edit your frames from the application. In addition, you can’t convert videos to GIFs or record your screen which is another big flaw in our opinion. 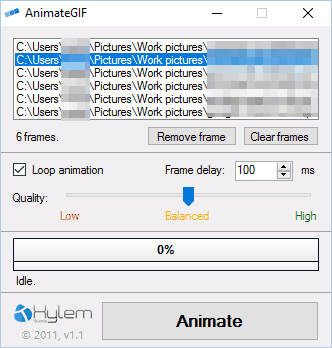 SSuite GIF Animator is a simple application, but it doesn’t offer any advanced features, so it will be useful only to the most basic users. The application is free and portable, so feel free to try it. This application is a video editor, but it can also create GIF images from videos. The application offers a modern user interface, so it’s perfect for all users. There’s a frame by frame preview available, but you can also adjust your colors or apply various effects to your videos. The application has support for advanced text editing, screen recording and there’s also an audio mixer available. Wondershare Filmora allows you to play two or more clips simultaneously, and you can also easily trim your videos in order to optimize them. The application offers a wide array of features for video editing so it’s perfect for advanced users. GIF creation feature is available, and the application works with AVI, MPEG, WAV, DAT, EVO, MKV, MP4, WMV and other formats. As for GIF editing, you can crop, rotate, speed up or slow down your GIF. In addition, you can apply color correction to your GIF or add text and other effects to it. If you prefer working with images, you’ll be pleased to know that you can create GIFs from still images as well. Wondershare Filmora is a powerful application for video editing, but it can also create GIFs with ease. If you want an application that can edit video files and create GIFs, you should definitely consider Wondershare Filmora. The application is available for free trial, but if you want to continue using it, you need to purchase a license. Another application that can help you create animated GIFs is GIF Movie Gear. The application has a simple user interface that allows you to see all available frames. If needed, you can simply select multiple frames in order to edit them. As for editing, you can easily set the delay for each frame. In addition, there’s a LiveEdit feature that allows you to edit a single frame or entire animation in a third-party image editor. The application also has a palette reduction feature so you can easily optimize the size of your GIF image. Speaking of image optimization, there’s an inter-frame feature to help you minimize the image size. The preview window is also available so you can easily preview your animation with a single click. It’s worth mentioning that you can easily move, crop, rotate or flip your frames or simply crop an entire animation. The application also has infinite undo steps, so you can easily correct any mistakes. GIF Movie Gear works with various formats, and you can even import a video and convert it to GIF. In addition to image formats and AVI videos, the application also works with Photoshop files. As for additional features, you can easily edit the transparency or generate the HTML code and import your GIF to any website. 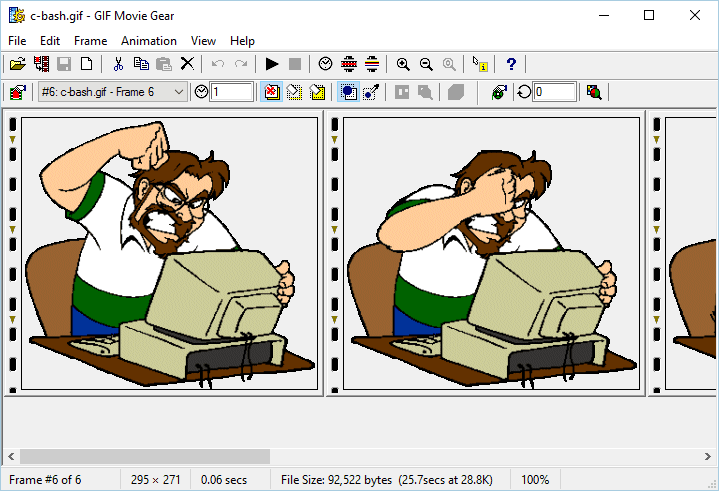 GIF Movie Gear offers a wide array of features, but it doesn’t have the most friendly user interface, so it might take you a while to get used to it. The application doesn’t have a built-in image editor which makes it a bit harder to edit your frames. Overall, GIF Movie Gear is a decent application, and you might want to try it if you don’t mind its slightly outdated interface. The application is available as a 30-day trial, and if you want to continue using it you need to purchase a license. If you want to create your GIF images from scratch, you can do that by using Falco GIF Animator. This application works as a simple image editor and you can easily create your GIF images or icons from scratch. As for supported formats, you can work with BMP, GIF, PNG, JPG, ICO, CUR and ANI files. It’s worth mentioning that the application supports unlimited number of undo and redo steps, so you can easily correct any mistake. The application has a basic image editing tools so you can easily create simple shapes. If needed, you can also rotate, flip or change contrast or brightness of your image. It’s worth mentioning that this application has about 25 different visual effects to choose from. In addition to effects, you can also use one of 13 different image improvements. The application also has a built-in wizard that you can use to create animated GIFs or banners. Falco GIF Animator is a decent tool, but it comes with a slightly outdated interface so it might be a bit confusing to use. The application is free, and if you don’t mind slightly outdated interface you might want to try it out. It’s worth mentioning that this application comes bundled with some unnecessary software. This software is optional, and you can choose not to install it during the setup process. Another application that can create animated GIFs is KickMyGraphics. The application comes with humble user interface and it allows you to create animated GIFs from local images. In addition, you can also paste images from your clipboard directly to the application. The application also supports video files, but you need to convert the video before you can edit it. We had some major slowdowns while trying to convert videos to GIFs using this app, so if you want to convert a video to GIF we recommend you use shorter videos. The application offers live preview so you can see how your animation looks at any time. You can also see all available frames and remove unnecessary frames with ease. As for editing, you can’t add your text or adjust the brightness of your frames, but you can change their width, height and the zoom level. You can also enable Loopback or Reverse mode and set delay, step frames and number of repeats. You can also configure output quality right from the application. Screen recorder feature is available, but unfortunately we weren’t able to start it. KickMyGraphics is a simple application and it doesn’t offer any advanced features. Even though you can convert videos to GIFs, the process is slow and more complicated than in other applications. Lack of editing options is also a flaw as well as the simplistic user interface. This is a decent application, but it doesn’t have anything special to offer. If you still want to try it, the application is completely free. Giphy is a famous GIF hosting website, but in addition to hosting GIF files, this website comes with a useful web app that can create GIFs. To create a GIF, you just have to copy its video URL and you’re good to go. The service works with YouTube, Vine and other video hosting websites. If you want, you can also upload files from your local hard drive and turn them into GIFs. After choosing your video, you need to set start time and the duration of your GIF. If needed, you can also add a caption and position it anywhere you want. As for caption, you can choose between 8 different colors and three different styles. There’s also a preview section available that allows you to see your changes. The preview is a bit slow, which makes it harder for you to select the desired segment. After you create your GIF, you can copy its link, download it or view its embed code. Giphy also allows you to combine images or GIFs in order to create animated GIF slideshows. In addition, you can add captions and animated text to your GIFs. Lastly, there’s also a GIF Editor available so you can add stickers and filters to your GIFs. Giphy is one of the most popular GIF hosting websites, and it comes with a useful web app that allows you to create GIFs with ease. This service is completely free, so be sure to try it out. Another popular GIF hosting website is Gfycat. The service is completely free to use, and it also allows you to create your own GIFs from web videos. The service works with YouTube, Facebook and other video hosting websites. In addition, you can also upload video files from your hard drive and turn them into GIFs. After you select your video, you need to select the segment you want to use for your GIF. Gfycat has a 15-second limitation for GIFs which is more than enough for most users. You can also add various captions to your GIFs, but you can’t move them freely or change their appearance. We have to mention that you can add multiple captions and choose how long will a certain caption be visible on the screen. Gfycat is a great GIF hosting service, and you can use it to easily create GIFs from online videos. The service doesn’t offer many editing options and that’s its only flaw. Despite this flaw, Gfycat is still a solid service and you should definitely try it out. If you’re looking for a powerful web app that can easily convert videos to GIFs, we have to recommend Gifs. This service allows you to convert any web video to GIF. You can select the segment of the video you want to use, but you can also perform various editing. For example, you can add padding or crop your GIF, but you can also change hue or saturation. If needed, you can also invert color or flip your GIF. In addition, you can also add various captions and stickers to your GIFs. It’s worth mentioning that you can freely move your captions and stickers, and you can even choose the specific time to show or hide effects and captions. After you create a GIF, you can share it with others via social networks. If you want, you can also copy its link or the embed code. Gifs is a great service and it offers a wide array of features to its users. This service is completely free and it’s one of the best available GIF web apps. Another web service that can help you create GIFs with ease is Imgur. This is a famous image hosting service, but you can also use it to create GIFs. To create a GIF, simply paste the video URL and wait for the web app to process it. After doing that, you just need to set the start time and the duration of your GIF. It’s worth mentioning that Imgur can create GIFs that are up to 15 seconds in length which is more than enough for most users. In addition, you can also add captions to your GIFs, but you can’t customize them in any way. This means you can’t change the appearance or move the captions freely. Imgur offers a solid GIF creation service, but we have to admit that some advanced options are missing. On the other hand, the service is simple to use so it’s perfect for first-time users that want to create a GIF from a web video. Creating a GIF image isn’t hard as long as you have the proper tools to do it. Most tools on our list are completely free, so don’t hesitate to try them out. Editor’s Note – we changed the date to reflect the inclusion of even more great tools that you can use to create gifs.